Absolutely lovely! I want more. I'm a big Bubble Bobble fan, and I love spoopy stuff, so this was great! I do miss the rewarding treasure drops from Bubble Bobble, though. I think that would add a lot here. Conceptually and visually A+ ... but, I really find the control to be unworkable for me. I want the camera to give me much more of a window to speed up and slow down. Otherwise it feels like you are always sharing the same wave, and then the outcome feels random rather than skillful. It is not clear to me how these results are selected, or why there are not additional results. The tag view for the tag "fishing" is what I would expect to see, and much more useful to me. However, the entry into that tag view is not obvious nor is it clear that I am not already in fact looking at the results for that tag. Ideally, there would be a much more visible invitation into the fishing tag from these search results or perhaps when a search is an exact match to a tag, the search results should default to the tag results with some sort of "you are looking at the tag fishing. 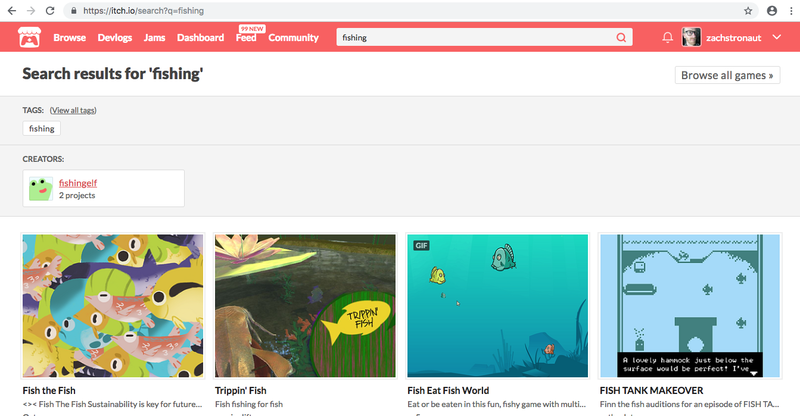 click here to search for the word fishing instead"
Bitsy's CPU usage spikes, the game input response time plummets, and the Chrome browser GUI also slows to a crawl. Games are basically unplayable. This has been true for me for at least the last three Chrome version auto updates. I'm currently at 70.0.3538.102. I'm on Mac OSX 10.12.6. I don't feel like this problem existed when Bitsy first launched. Very, very sue-able... Does that mean you should get 5 stars or 1 star? I really don't know. Also very fun! That transition in/out with the CRT effect warms the cockles of my heart. Could be and should be in an actual cabinet next to the original. I absolutely love Missile Command... it is probably the most nerve wracking game ever. I think you should flesh this out... I think it has a lot of potential for local mutliplayer. Not sure how I feel about the unlimited ammo / constant rate of fire. Hello fellow lover of snakes / NIBBLES.BAS! I thought the charging was a cool twist, but I would have liked the length of time I charged to mean breaking through more boxes. I love Bubble Bobble so much! You did a fantastic job of being dangerously close to the real music. I like the re-imagining of the dragon sprites and the quirky telescope theme, which somehow feels very cohesive. Controls were good, but it took me a few plays to understand the scoring. Yay! Another lover of snakes, NIBBLES.BAS, etc! I think perhaps your most sue-able decision is the title screen? hehehe... love that monochrome bitmap rendering of Worms characters. Wowza.... procedural levels, pickups, different kinds of bomb effects!!! You really went all out! I'm so glad somebody did Q*Bert!! I really like the faux CRT effect... I'm a sucker for that. Oh, and bad puns. I love those, too. I came because of the GIF. It was slow, slow like my ensuing golf clap, that I realized the abomination at which I looked. Really charming graphics and sound, and a great "duplication" of one of my favorite NES carts! Very tough but compelling gameplay. Joggernauts community · Posted in Introductions! Hello everybody! I'm Zachary Johnson aka Zachstronaut. I'm the programmer on our team, and I also do a lot of work on game design and level design.